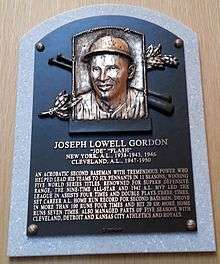 Joseph Lowell Gordon (February 18, 1915 – April 14, 1978), nicknamed "Flash" in reference to the comic-book character Flash Gordon, was an American second baseman, coach and manager in Major League Baseball who played for the New York Yankees and Cleveland Indians from 1938 to 1950. 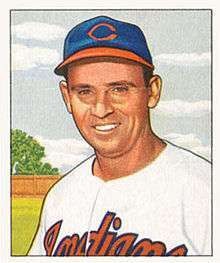 He was inducted into the Baseball Hall of Fame in 2009. On August 16, 2008, Gordon was inducted into the Cleveland Indians Hall of Fame. Two of Gordon's grandchildren were present for his induction ceremony. On December 7, 2008, Gordon was elected to the Baseball Hall of Fame by the Veterans Committee with 10 out of 12 possible votes, 83.3%, and was inducted into the Baseball Hall of Fame on July 26, 2009; of the 20 candidates on two ballots, he was the only player to be selected. His only daughter, Judy Gordon of Idaho Falls, Idaho, gave his induction speech in Cooperstown in front of 21,000 people in attendance. "He (Joe) insisted against having a funeral", Judy said in the closing remarks of her speech. "And as such, we consider Cooperstown and the National Baseball Hall of Fame as his final resting place to be honored forever." 1 2 "Joe Gordon Statistics". Baseball-Reference.com. Retrieved 2008-12-09. ↑ Reidenbaugh, Lowell; Steve Zesch (1988). The Sporting News Selects Baseball's 25 Greatest Teams (Hardback) (1 month=August ed.). Charlotte, North Carolina, US: Sporting News. p. 166. ISBN 0-89204-280-X. Archived from the original on 2010-10-10. ↑ "Society of the Sigma". Magazine of Sigma Chi. 66 (4): XI. 1947. 1 2 3 4 5 "Joe Gordon Minor League Statistics & History". Baseball-Reference.com. Retrieved April 19, 2012. ↑ Joe Morgan (2003-06-26). "Remembering Larry Doby's dignity, courage". ESPN.com. Retrieved 2007-11-29. ↑ Barbara and David P. Mikkelson (2006-01-02). "Larry Doby". snopes.com. Retrieved 2007-11-29. ↑ "Top 100 Greatest Cleveland Indians Players". Cleveland State University Library. Retrieved 2007-11-29. ↑ "New York Yankees celebrate the election of Joe Gordon to the Hall of Fame" (Press release). New York Yankees. December 8, 2008. Retrieved December 12, 2008. ↑ Adams, Russell (April 29, 2010). "Who Is the Greatest Yankee?". Wall Street Journal.